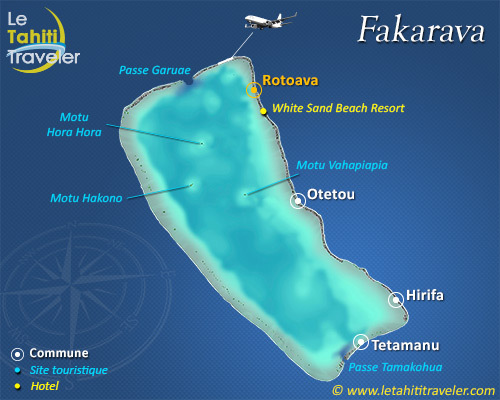 The second biggest atoll in Polynesia -a 60 km by 25 km rectangle- has two main villages: Rotoava in the northeast near the Ngarue pass, one kilometer wide and its airdrome ; and then there is Tetamanu, formerly the main village of the island located near the southern Tumakohua pass. This protected atoll together with its six neighboring islands, originally including Taiaro, makes up a UNESCO classified nature reserve, which is the proof of the richness of the ecosystem of these atolls : the especially rare flora and fauna, including the hunting kingfisher, the Tuamotu palm, and in the lagoons, crustaceans such as squills or sea cicadas. Among the things to be explored here are : a pearl farm visit and the fairly a colorful visit to the sea slug smoke house, the rori highly prized by Asian gourmets, and the ancient village of Tetamanu with one of the first Catholic churches built in coral and dating from 1874.